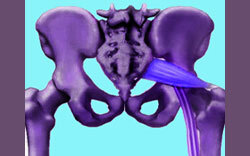 Are you suffering with piriformis pain? We can help. We are a completely free and expert-written resource that fosters a community environment where patients can learn everything they need to know about piriformis disorders. Piriformis pain can be caused by injury, imbalance, hyperlaxity or excessive tension in this small muscle which is located deep in the anatomy of the buttocks, near the hip joint. Piriformis symptoms can take many forms, including discomfort that is experienced in the muscle itself, as well as pain that mimics sciatica by traveling into the leg and possibly even into the foot. 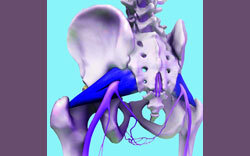 Piriformis syndrome is the name of this type of radiating pain and it is certainly a diagnosis on the rise. 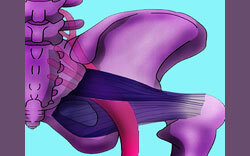 As an educator, researcher and advocate, I promise to help you to learn everything about piriformis muscle pain. As a fellow chronic pain sufferer, I completely empathize with your situation and hope that you find your cure here. If you need immediate help with severe pain, please learn more about our proprietary and proven pain relief program. The program is available 24 hours a day from anywhere in the world and has enjoyed widespread international acclaim among doctors and healthcare organizations. All of our site topics are featured prominently in the navigation bar. Each of our primary subjects is divided into smaller discussions which highlight a specific facet of the overall topic. In order to truly get a complete picture of each resource section, please read all the articles within. We also offer a site map and a website search feature that returns results across all of our web properties for excellent coverage of every chronic pain topic. We commend you on your desire to become more knowledgeable in order to end your pain. We will do everything possible to assist you in this objective. We are easily reachable on any of our social media outlets, should you need to contact us. We are an independent patient education and advocacy organization. We do not accept sponsorships or financial incentives that could potentially compromise our editorial objectivity. In fact, we never allow money to get in the way of providing you the honest facts. All of our material is written by our world-class volunteer editorial board as a public service. If you choose to support our mission by donating, or purchasing our products, please know that 100% of the funds go towards our research, education and advocacy efforts. Your generosity will directly help us to help others, many of whom are underserved when it comes to access to quality healthcare information and services. Thank you.